The addition of that simple technique to my painting arsenal stepped up my painting game immensely, but the one issue I ran into with working with thinned paints is that, like all paints, they gradually dry out on your palette thus throwing off the consistency of your paints. The one tip that had been recommended to me to keep this from happening was to use a wet palette to keep my paints properly thinned. 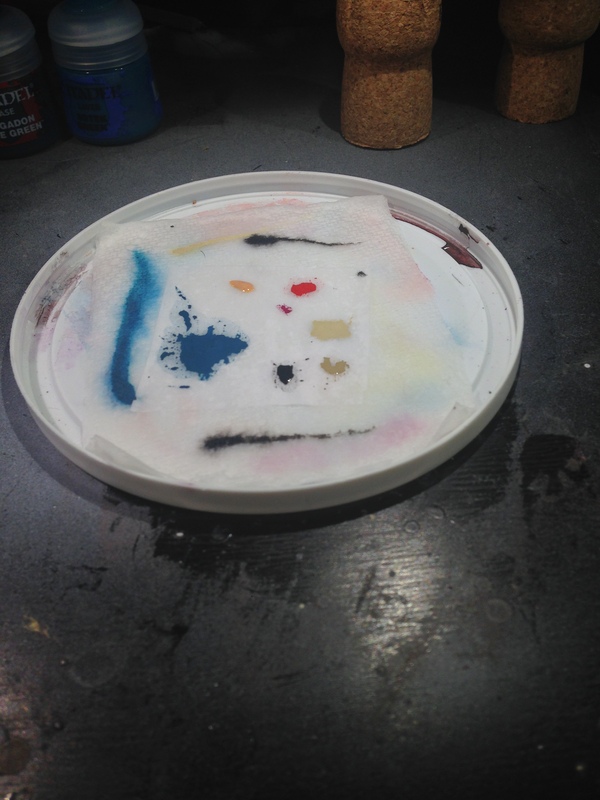 I had always been hesitant to pick up a wet palette because I wanted to spend my hobby money on more little plastic dudes to paint instead of on something boring like a palette, but then I discovered how to make my own wet palette on the cheap. 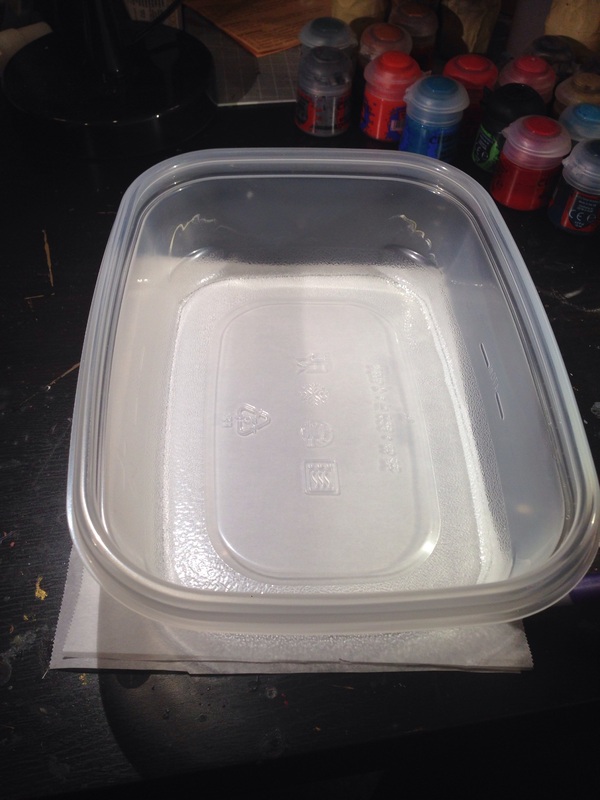 In this hobby tutorial I will show you how to make your own wet palette for amazingly cheap. First off, an explanation as to what a wet palette does and why you should use one. Basically a wet palette has a semi-permeable top layer (your work surface) with a water reservoir beneath it; you mix and thin your paints on the work surface and water from the reservoir beneath keeps it from drying out. This means that your paints will stay properly thinned from several hours to several days, although I recommend you cover and refrigerate your palette in between work sessions if you will be keeping your paints on the palette longer than a couple of hours. Keeping your paints viable longer keeps your painting consistent and lets you have that perfect 50/50 mix of stay a 50/50 mix instead of you having to remix and version two being a 40/60 mix. Parchment Paper–As I mentioned in my tutorial on making a photography light diffusion box, this stuff is incredibly handy and I always keep this around the house (seriously, try baking some cookies on parchment). If you don’t have parchment around your house, you can find it at the grocery store for just a few dollars per roll. This will be the working surface of your wet palette. 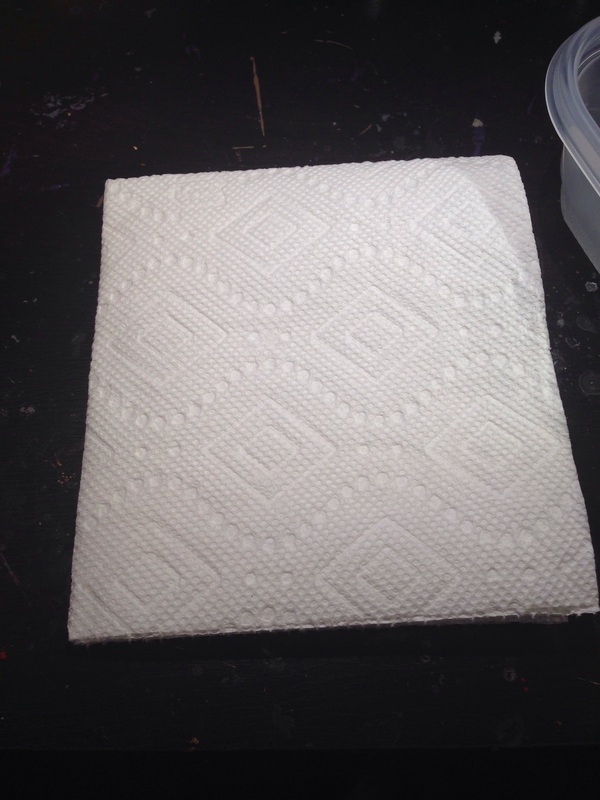 Paper Towels–You should have these around your hobby area already to dry your brushes after rinsing; also everyone needs to clean up their hobby area sometime! I like to use the kind of paper towels with the “select a size” feature because the smaller half sheets are great for all kinds of hobby needs, although for this application we will be using full sheets of paper towel. This will be the water reservoir for your palette. Plastic Food Storage Container–You’ll want one that has the base area of approximately that of a quarter sheet of paper towel (or folded in half if you’re using the “select a size” towels I mentioned above) and the has low sides. You probably have a few of these chilling in your kitchen, but I recommend picking up a new one for this (only costs a few dollars and the rest that come in the pack can be used for their intended purpose). The sandwich size containers work well for this. Update: Since the time I originally posted this tutorial I have started using a lid from a tub of sour cream as it has a lower profile than the food storage container, so I don’t randomly bump into the sides of my palette while I am painting. Scissors–You’ll need these to cut and trim your parchment paper. Water–This is called a wet palette for a reason. Now that you have everything you need, let’s make a wet palette! Tear off some parchment paper at approximately the width of your plastic container. I found that the average roll of parchment is about twice as wide as the longer dimension of my plastic container so I cut the sheet of parchment in half to make two work surfaces in one go. 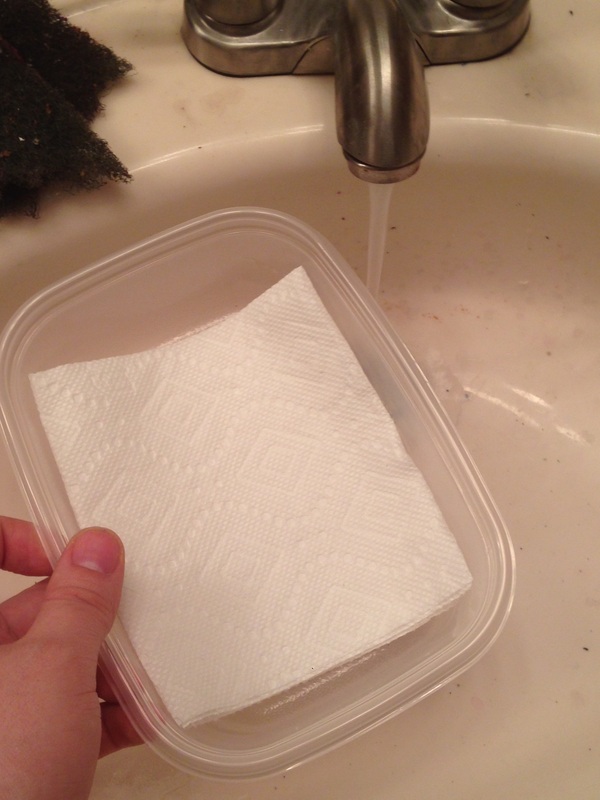 Next, take a sheet of paper towel and fold it into quarters so that it will fit into your plastic container. 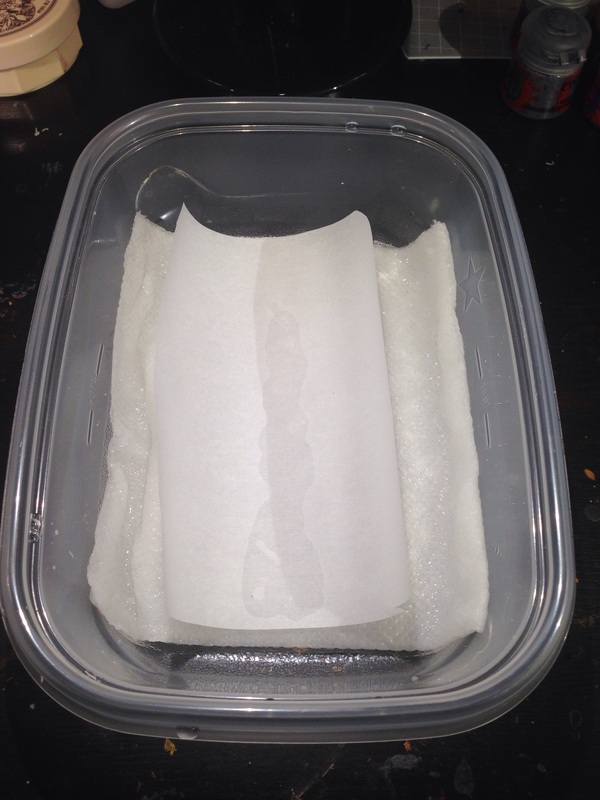 Cut your parchment so that it will fit entirely on top of the paper towel and will fit inside your plastic container without bumping into the edges. 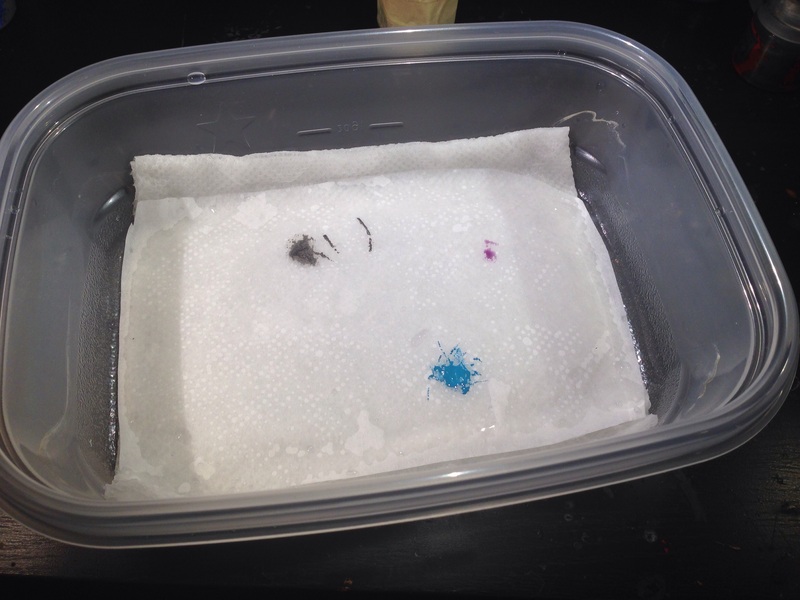 Set the parchment aside and put the folded paper towel inside the plastic container. Now it’s time to get your wet palette wet! Take your dry wet palette to the sink (or bring some water to your dry wet palette) and thoroughly soak the paper towel in cool water; pour off any excess water that the paper towel doesn’t soak up. Place your cut piece of parchment paper on top of the wet paper towel and gently work the air bubbles out from underneath of it by gradually pushing them towards the edge of the parchment with your fingers. Then, flip the piece of parchment over and work the air bubbles out again. Working the air bubbles from out under the parchment probably wrung a little bit of water out of the paper towel, so dump the extra water out. Your wet palette is now ready to use! You can use your wet palette just like you would use whatever you were previously using as a palette (plastic palette, plate, tile, etc.) but now your paints won’t dry out on you! Not only does this keep your paints properly thinned and keep you from having to remix custom hues as often, it also means you waste far less paint than with a traditional palette–all of that paint build up on your old palette is wasted paint! I like to keep a dry paper towel underneath one end of the palette to wipe my brushes on. The air spaces in sponges are larger; this means that you will have larger air bubbles between the surface of your reservoir and your parchment. Also, the water tends to drain to the bottom of the sponge leaving you with less moisture available to your work surface, while the water tends to stay consistent throughout the thickness of the paper towel. Sponges are reusable; while this sounds like a good thing, it’s actually a really bad thing. If you have a reusable sponge you are going to reuse it and over time it is going to get nasty and have things growing in it. Paper towels are disposable and keep your palette from getting moldy and gross. 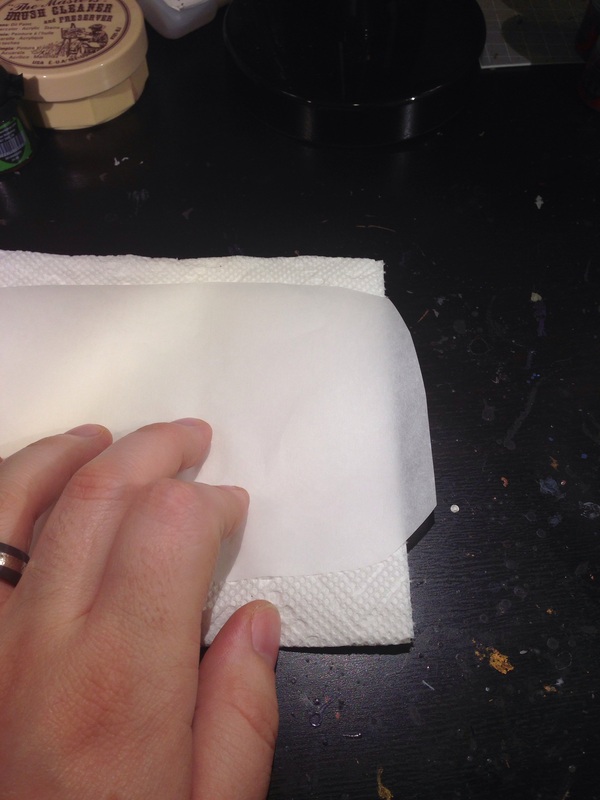 You already have paper towels at your hobby desk (or at least you should!) so they are effectively free to use for this project and you don’t have to hunt down anything special. I hope this tutorial helps you to improve your painting. Let me know what you think! Update: Since the time I originally posted this tutorial I have started using a lid from a tub of sour cream as it has a lower profile than the food storage container, so I don’t randomly bump into the sides of my palette while I am painting. If you’re going to be storing your paint overnight, you can use the tub itself (so long as it no longer contains sour cream) to cover your palette between sessions. I use a sponge in my wet palette and it’s made a HUGE difference to my painting ( http://www.spruegrey.com/diy-wet-pallette/ ). However, I hadn’t considered that the sponge’s gaps between holes and the water naturally collecting towards the bottom of the sponge would have an effect. Now that you mention it, though, both points make sense. I think I’ll have to re-build my wet palette. Thanks! I usually use a sponge in my wet palette and it’s made a HUGE difference to my painting ( http://www.spruegrey.com/diy-wet-pallette/ ). However, I hadn’t considered that the sponge’s gaps between holes and the water naturally collecting towards the bottom of the sponge would have an effect. Now that you mention it, though, both points make sense. I think I’ll have to re-build my wet palette. Thanks! Concise and to the point. Now I really want to make one for myself (again). Last time I tried the parchment paper I bought was of waxed variety and it failed to let the water above the surface. Let’s see if I manage it this time! Put some pennies in the water, that will reduce growth of nasties; copper is a natural antimicrobial & antifungal substance. Thank you for the post! I always had a suspicion that baking paper is not as good as wet palette paper! You actually proved it.